Quip (Distorted Humor) kept his perfect record in tact with a coast-to-coast victory in his first try against winners, streaking home to become the newest “TDN Rising Star” and the first for trainer Rodolphe Brisset, who went out on his own in February after serving as an assistant for Hall of Famer Bill Mott. Graduating by a head in his six-panel unveiling at Churchill Downs Sept. 23, Quip was installed as the 9-5 second-choice while navigating added real estate here. Jockey Florent Geroux acted quickly when Quip’s inside neighbor began to float out, taking back and tucking his mount in towards the rail. Seizing command, Quip floated along through early fractions of :24.05 and :48.45 while displaying some greenness. Showing the way into the lane, the bay fought Geroux a bit about switching his leads, but kicked into another gear once he changed leads in mid-stretch. Floating out a few paths in the lane, Quip was kept to task by Geroux and cruised home a much-the-best winner. It was 6 1/2 lengths back to runner-up Boxing Glove (Alternation). Breeder and part owner WinStar Farm purchased the winner’s dam Princess Ash (Indian Charlie), a half-sister to GISP Normandy Invasion (Tapit), for $200,000 at the 2013 Fasig-Tipton July Horses of Racing Age sale. Quip is her first foal and she has since produced a yearling filly by Speightstown and a weanling filly by Distorted Humor. 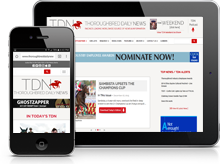 The 8-year-old mare was bred back to MGISW and “TDN Rising Star” Constitution.